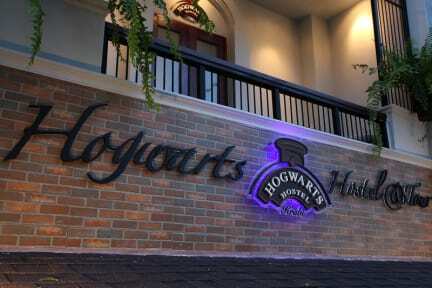 Hogwarts Hostel is located in City Plaza, the center of Krabi town, where you can explore Krabi downtown and night market in just few minutes walk. Moreover transportation or bus stops to several travelling places is in just steps away. Offering cozy and clean beds, Hogwarts Hostel is a warm and friendly hostel that welcomes the backpackers all over the world. 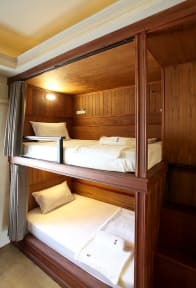 Make yourself at home in one of the air-conditioned dorms featuring free linen & towel, individual reading light and individual storage (please bring your own lock/key or available for sale). Shared bathrooms with showers boast hot water, with showers and shampoo. Guests can relax in our chill out room; complete with cable TV, or catch up with friends and family over the internet. Free Wi-Fi access is available throughout the hostel. - Deposit 300 Baht is required when check-in and will be returned when check-out in normal condition. 3. Cash payment in Thai Baht upon arrival only. 4. Cancellation policy: At least 2 days advance notice before the arrival date is required for free cancellation. Mooi en schoon hostel in het centrum van Krabi town. Leuk ingericht in harry potter thema en een goed ontbijt. Despite the fact that the wifi is not properly working, the hostel is really great. Bit quite due to low season! Staff really friendly, kept asking if my sick sister was okay. Everything is clean and breakfast is small but nice :) Beds and lockers are large and private. Balcony is also pleasant..
Heel mooi en net hostel. Ligt centraal in krabi, dus prima uitval basis om dingen te ondernemen. Het hostel is niet echt echt gezellig, heeft geen gezellige gemeenschappelijk ruimte. Personeel is vriendelijk maar spreekt slecht Engels. Bedden zijn super hard, niet echt confortabel slapen. Gordijnen en airco in de kamer zijn wel fijn. Didn't like the place, made me wait for 15 minutes before check in without saying hello. When checking out he made me walk up 2 times to the top floor. First to get my towel to get the deposit back. Then when I came came down again with the towel he wanted me to go back up to get the blanket, why not tell me the first time. All this while he knew I was getting late to take my flight.